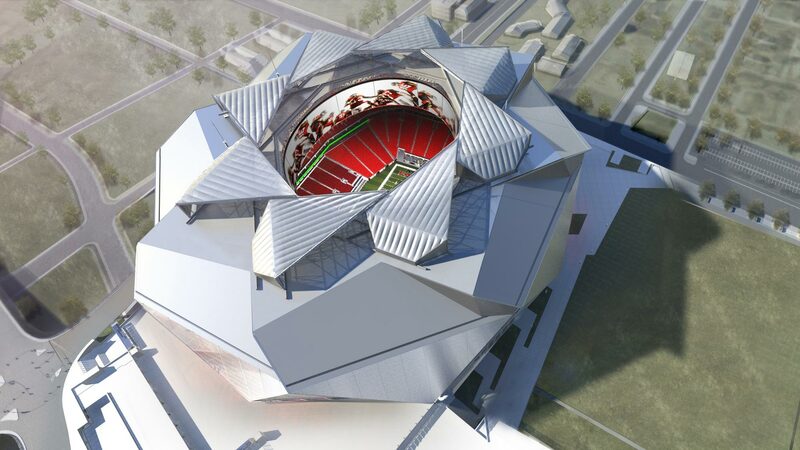 Every time I see one of the local news stations run the animation of the retractable roof on the new Falcons stadium I cringe because it’s not a terribly elegant solution. It’s somewhat ironic that the supporters of the new stadium have gone to such great efforts to label the current football stadium as “tired and ugly”, and then went and picked something with such a massively dark roof, penetrated by such a small oculus – it’s a modern rendition of the Pantheon, without the elegant Roman engineering. When city leaders and football chiefs explain how the stadium will “let the sun shine in” you get the impression that the experience will be like sitting in the Rose Bowl, with nothing but sky above you. I mean, look at this photo of the sponsors with the model – it looks awesome!! 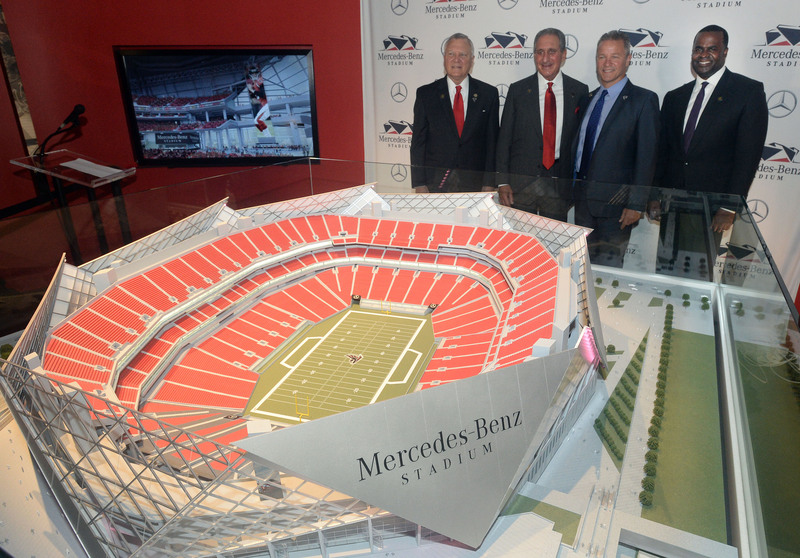 Note: the roof of the model has been removed so that you can see the field. Here, take a look a this aerial rendering. This begins to tell the real story of that roof. That football field sure is waaaaay down at the bottom of that dark well… but maybe this rendering is set at an unflattering camera angle, so let’s take a look at a more technical view that will clearly show us how far up there that little hole is. Wow. It really is way up there, and it’s really small, do you see that? It’s not much bigger than the field itself! Most of the seats aren’t under the opening, and do you see all those dark seats in the upper level? They’re really sheltered beneath that hard roof. Fortunately, those big windows on the side will help get some light in there, but they must have added a lot of additional lighting up there for night games and overcast days. On the plus side, it’s fairly unlikely that people in those seats will need to wear sunblock. 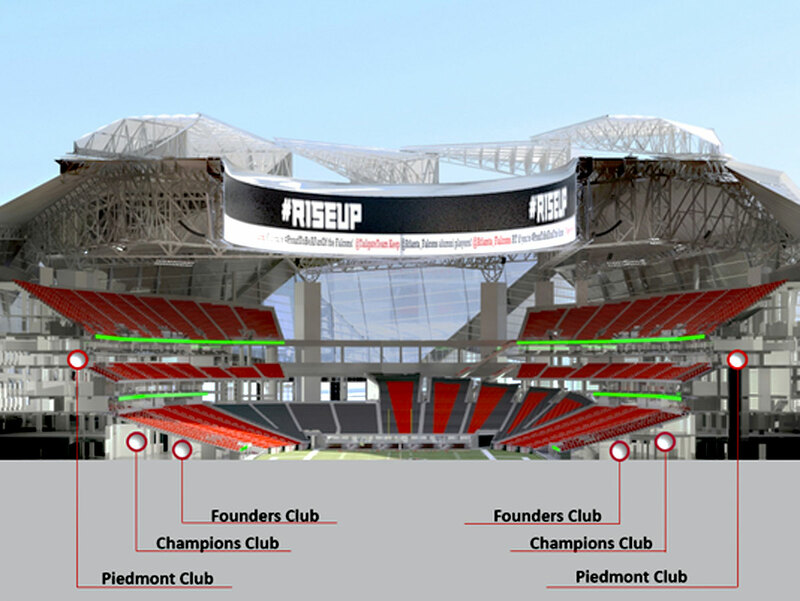 Do me a favor and look at this cross-section of the new stadium. This version of the stadium rendering is a LOT flatter than the previous image, and I don’t know which of the two is more accurate. However, for the sake of being conservative it’s the one that I’m going to use in a little experiment to see how far I would have to crane my head back in order to see out of that little hole in the roof. Do you see that green diagonal line in the middle of the image? That’s a line that I projected from the eyes of a tiny model of myself that’s seated in the front row of the end zone. The head on my mini-me has been set to be looking straight ahead, parallel to the ground plane. The angle I get from repeated tests is approximately 37 degrees above from the ground plane – and that’s just to see the top edge of the hole. You’ll have to tip your head even farther back to actually stare up at the sky – and that’s assuming that the flat version of the stadium is the one that gets built. If that really tall version is the one they’re building then you’re going to need professional help. Chiropractors who wish to become marvelously wealthy should take out a loan to advertise about neck treatments on the in-stadium screens.